Valley GPS guidance is now compatible with Trimble GPS and Deere's Starfire. Valley Irrigation recently expanded its GPS guidance offerings to include John Deere's Starfire system and Trimble GPS products for its corner and linear irrigation systems. 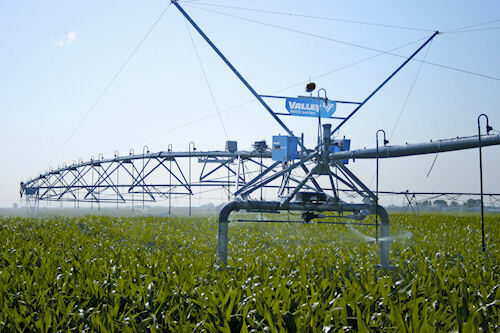 The compatibility will allow irrigators already using the popular systems will be able to take advantage of the technology to improve their precision water application, say Valley officials. The technology also allows producers to install precision machinery on rented ground, or fields with underground obstacles, without the labor of using buried wire cable for guidance. Valley Irrigation has expanded its GPS product line to include compatibility with Trimble GPS products, including this corner machine running with GPS guidance. More information on the new Valley offerings is available at Valley and Trimble dealers.